The Panamanian government deserves international condemnation for the flurry of corruption accusations continuing to evolve after the conclusion of the Martinelli regime in July 2014. Many of Panama’s prominent political figures are now under criminal investigation, including the former president, Ricardo Martinelli (2009-2014). Allegations against the Martinelli administration call into question the United States’ strong trade alliance with this small yet influential Central American country. Both President Juan Carlos Varela Rodríguez’s new government and Panamanian society have called for an end to endemic corruption, with many demanding a new constitution. But the international community seems to have turned a blind eye to the fraudulent patterns of the Panamanian government—a dangerous apathy that only ensures the persistence of the government’s status quo. Previous articles by the Council on Hemispheric Affairs (COHA) and Eric Jackson, Chief Editor of The Panama News, have detailed Martinelli’s attempts to control the Attorney General’s office and wiretap his political opponents using U.S. Drug Enforcement Agency technology. According to a 2009 cable, written by then U.S. Ambassador to Panama Barbara Stephenson, which was later released by WikiLeaks, Martinelli had “sent the ambassador a cryptic Blackberry message that said: ‘I need help with tapping phones.’” Stephenson’s wire also added, “[Martinelli] clearly made no distinction between legitimate security targets and political enemies.” Martinelli dismissed the episode as a “misunderstanding.” Those who initially supported Martinelli as a pro-business alternative to left-wing leaders like Hugo Chávez of Venezuela are thinking again. Less than a year after stepping down from office, amid mounting corruption allegations, Martinelli fled the country on his private jet and is now believed to be in the United States. Martinelli claims to be part of a vendetta by Juan Carlos Varela, his former vice president, who unexpectedly won last May and succeeded Martinelli as president. Both Martinelli’s electoral and legislator’s immunities have recently been removed. Last month, Panama’s Electoral Tribunal lifted Martinelli’s electoral immunity, which he had held as president of the Cambio Democrático (Democratic Change) party. Additionally, up until this year, Martinelli would have received a special prosecution process under Law 55 (the “shield law”) as a deputy of the regional body, the Central American Parliament (Parlacen). However, in a Supreme Court corruption investigation that opened in April, high court magistrates voted to lift this legislative immunity. In this investigation, prosecutors suspect that Martinelli is at fault for the disappearance of a portion of the $1.2 billion USD budget for a welfare fund known as the Programa de Ayuda Nacional (National Help Plan). As with the previous investigation’s launch, renewed focus on the Martinelli Administration’s alleged crimes is likely to weaken his party and bolster Varela’s coalition. In addition, on June 8, Panama’s Supreme Court ruled that Martinelli should face a trial for alleged spying. Compounding the ex-president’s woes, two former directors of the executive’s national security agency remain in custody after being arrested in January under suspicion of illegal wiretapping. Local press reported that the Attorney General’s office could name 150 people, including the Archbishop of Panama, who had been illegally and secretly monitored. The president of Panama’s electoral court, who is affiliated with the Partido Revolucionario Democrático (the Democratic Revolutionary Party), was also targeted. Former presidential candidate Juan Carlos Navarro issued a proclamation on February 2 alleging that his emails and cellular phone were bugged during the campaign. “This was a massive, illegal spying operation,” he told the Economist later that month. During his mandate, in a bid to shield himself from scrutiny and increase his disposable political power, Martinelli stacked Panama’s courts and other key government institutions and unsuccessfully attempted to alter Panama’s constitution to allow him to run for reelection. Furthermore, the government received 15 percent of the profits from Martinelli’s megaprojects, which included a highway, a sprawling hospital complex, and Central America’s first metro, according to the Los Angeles Times. It is suspected that Martinelli stole a large portion of this money. Martinelli also managed to accrue a public debt of $23 billion USD. According to Jackson, the total amount of government money directly spent on advertising during the Martinelli years should also be the subject of the ongoing audits and criminal investigation. According to the PanAm Post, Martinelli could become the first public official since Panama’s return to democracy in 1989 to face criminal proceedings for embezzlement. In an interview with COHA, Eric Jackson appeared optimistic about the political demise of Martinelli and his administration. However, Varela appears somewhat timid and is likely to embark upon negotiations with Martinelli; to date, none of the “big fish” in the Martinelli administration have been brought to justice. In a June 23 hearing in a tribunal connected to the National Assembly, a case addressing enormous corruption by former Supreme Court Judge Victor Benavides was remitted to the Public Ministry. The Deputy Chairman of the tribunal, Hector Carrasquilla, claimed that the case was dismissed from the process—not because of a lack of evidence—but because Benavides resigned on June 19, removing him from the jurisdiction of the National Assembly. Benavides’ case is now likely to be examined by a deputy prosecutor. He is the second Supreme Court judge to be accused of exchanging case votes for money in the past year. Tight connections and mutual aid in the vote-selling network have operated for years to maintain a shroud over such deals. The judge’s resignation came after accusations surfaced that he sold court rulings to interested parties, as well as some claims that he has sexually abused minors. Benavides had only five months left in his term after holding the position for ten years, during which he accrued connections and, evidently, riches. Public awareness of his actions spiked in April when Vicente Caballero, Benavides’ former bodyguard, released an accusatory statement against the judge. In his resignation letter, Benavides claimed Caballero was seeking revenge for being imprisoned for kidnapping Benavides’ mother. Caballero’s claims raise significant questions regarding the ethics of the country’s legal system. These recent events follow the October 2014 suspension of Alejandro Moncada, another former judge on the Supreme Court. After investigation by a court under the institution of the National Assembly and a guilty plea to falsifying documents, Moncada was sentenced in March to five years in prison for embezzlement. In response to his 2014 suspension, Moncada claimed to be victim of President Varela’s attempt to increase accountability in Panama’s high offices by shifting the Supreme Court. Nonetheless, attempts like Varela’s to transform an institution fraught with charges of its own misconduct will be important in constructing a responsible new government. Jonathan Farrar, former U.S. Ambassador to Panama whose mission ended June 5, also emphasizes the importance of governmental and judicial accountability. Early last month, Farrar told La Prensa that “it is very important” for the Varela administration to continue to emphasize transparency in the legal system. There must be continued investigation into vote-selling and embezzlement if Panama is to mend the harm done by a system that allowed at least two judges to sell votes in the Supreme Court, Panama’s supposed ultimate arbiter of justice. The manipulation of American expatriate and multimillionaire Wilson Charles Lucom’s will in a 2011 Supreme Court case illustrates the extent to which judicial corruption cheats Panama’s non-elite. After his death, the millionaire had enclosed in his will $50 million USD (which has since appreciated to $150 million USD) to benefit Panama’s impoverished youth. In 2011, however, his wealthy Panamanian widow circumvented his legal decree through Panama’s Supreme Court and obtained full control of his assets. This case is yet another instance of judicial actions that cater to powerful individuals at the expense of justice. Panama’s political elite have also used illegally-obtained funds to purchase high-value resort and deluxe properties along Panama City’s newly-developed coast. These investments provide tangible evidence of a shameful extension of wealth accrued through illicit deals. According to the Panamanian lawyer Marcos Wilson, those in government positions who embezzle funds often purchase luxurious properties and transfer money to offshore accounts, creating a “Mexicanization of politics” in Panama where a veil of secrecy surrounds politicians’ corporate transactions. Moncada, the Supreme Court judge recently sentenced to prison, used some of his embezzled money to purchase at least two apartments worth $1.7 million USD through the real estate businesses Celestial Corporation S.A. Company and the Alpil Corporation, S.A. Judges of a National Assembly subcommission ordered him to relinquish the two apartments as part of his sentence in February. Corruption becomes obvious when judicial figures like Moncada, whose salaries are not particularly high, possess such lavish real estate. The lawyer Abilio Batista, who Caballero denounced in his April statement against Benavides, is listed as manager of a real estate company Inmobilaria Abu Panamá, along with Benavides’ nephew Edwin Villar. The financial connection between Batista and Villar and the familial link between Villar and Benavides create a central triangle that provided each of them with power and a means to launder money. Money laundering in Panama ultimately harms the stability of Panama’s highly inter-connected economy. While the national economy may appear to be thriving, debt and income inequality threaten the long–term prosperity for Panamanians who seek well-paying and stable jobs. Moreover, much of Panama’s current wealth is built on huge loans and other forms of debt to foreign investors. Money laundering exacerbates this instability; embezzled riches are transferred to offshore accounts as perpetrators of these shenanigans attempt to cover their tracks. It has also, in part, stimulated the recent real estate boom in Panama. Though the country’s celebrated prosperity has involved purchases of luxury buildings, money-launderers often leave them empty, and neighborhoods in Panama City are disrupted and sometimes destroyed for the sake of real estate development and speculation. Pervasive money laundering in Panama has put the nation on the gray list of the intergovernmental Financial Action Task Force. To combat this status, in April, the country’s legislature passed an important measure as part of the initiative Panama United Against Money Laundering. The law creates “a commission against money laundering…and a financial analysis unit that will collect and analyze reports of suspicious operations.” This measure may create the offices for tackling illicit financial activities, but the commissions must be bold enough to investigate powerful figures and must remain honest in order for the law to truly address money laundering. Through this mechanism and by means of tribunals held by the National Assembly, Varela’s government must continue to support investigations into instances of corrupt practices such as the Benavides and Moncada cases. Within the past decade, officials at the University of Panama have exposed one small segment of the country’s endemic corruption. Just two months ago, Aristotle García, a University of Panama official, accused University Director Gustavo García de Paredes of buying Benavides’ vote in a recent Supreme Court case. García was dismissed from the university in April and has been seeking an explanation regarding the legality of his dismissal. The University of Panama, the country’s main public institution of higher learning, has a history of blatant corruption. In 2005, COHA reported on a scandal in which Professor Bernal publicly accused university president García de Paredes of selling diplomas to students, allowing them to graduate without completing all of the requirements. As a result of his outspoken criticisms of university leaders’ fraudulent behavior, Bernal was fired from his position in the Faculty of Law and Political Science in March. In an interview with COHA, Bernal emphasized the administration’s self-interest and noted that, despite media attempts to destroy his academic reputation, student protests against the university’s lack of transparency contributed to his cause. The following month, in compliance with a Supreme Court ruling, Bernal was reinstated at the University of Panama. Cyclical corruption, permitted under the Martinelli administration, as well as the persecution of faculty who take a public stance against violators of academic liberties, will inevitably defame the university as well as the country. Although Bernal was eventually reinstated, the aforementioned cases illustrate that Panama’s power structure, when extended to the university, is largely protected against bitter critics like Bernal and García. External pressure from the international community will be key if Panama is to ever increase its transparency and address its legacy of corruption. In fact, for the sake of stability, stakeholders invested in the country must condemn Panama’s string of recent scandals and pressure the government to increase its transparency and accountability and rebuild a system that has only cheated the people out of their share of the nation’s equity. As a maritime epicenter with 21 free trade agreements, Panama’s dependence on other economies seriously hinders what President Varela can do to address corruption. Fortunately, Panama’s civil society is maturing and now leading an unprecedented revolution against corruption. Late last year, thousands of concerned citizens joined hands in nationwide marches against Martinelli-era “corruption with impunity.” International support for similar efforts will be key in moving Panama toward an honest and transparent government that so many of its citizens are calling for. However, not everyone in the leftist faction is optimistic about the effectiveness of protests, which have continued into this month. Eric Jackson, for example, is among these skeptics. Instead, he calls for “a ruthless, independent campaign against the political class” organized around a series of political demands, such as the right to initiative, referendum, and recall by reasonable petition processes; an end to all of the legal devices of the political caste’s immunity; and election reform. Jackson believes that Varela could call for an election of delegates to a constitutional convention in the near future. Perhaps hinting toward constitutional reform, Jackson asserts “Panama needs to dismantle an infrastructure of abuse and build something better.” A truly revolutionary constitutional reform will require strong social and political mobilization on the part of independent-minded, leftist dissenters like Jackson and Bernal. Deference to abusers like Martinelli and his cronies will not do. UPDATED (1:08 p.m. Friday, August 14, 2015): A previous version of this article stated Panama was in South America, instead of Central America. It has since been corrected. 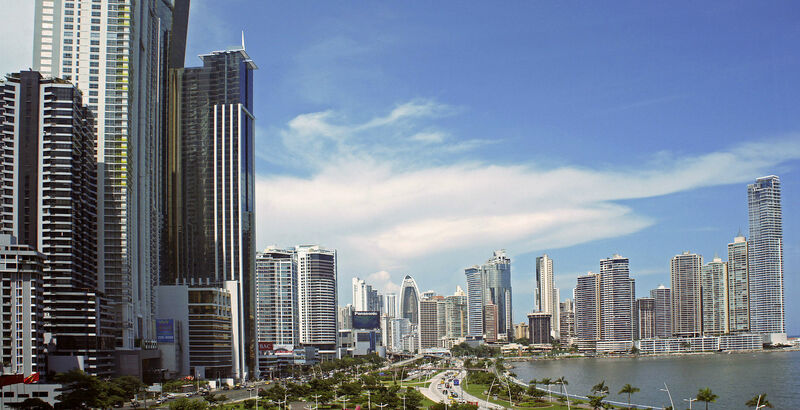 Featured Photo: Skyline Panama City, near Balboa Avenue and Punta Paitilla. From: Mario Roberto Duran Ortiz. Sexism in Politics 2016: What can we learn so far from media portrayals of Hillary Clinton and Latin American female leaders?